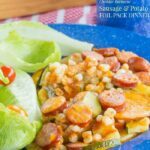 A simple meal with easy cleanup for cooking on a campfire or reliving camping memories at home. Start your campfire, light your grill, or preheat your oven to 450°F. Tear off six pieces of heavy duty aluminum foil or a double thickness of regular foil, and spray with olive oil or cooking spray. Toss the potatoes, olive oil, salt, and pepper in a bowl, and divide between the six pieces of foil. Divide the corn and zucchini between each of the pieces of foil. Drizzle with about two tablespoons barbecue sauce. Slice each sausage about 1/4 inch thick, and place slices from one sausage on top of the mixture on eech piece of foil. Top with about two tablespoons shredded cheddar cheese. Fold over the aluminum foil to form a pouch, drizle about a tablespoon of water in each pouch, and seal all of the edges. Place on the campfire, grill, or oven and cook for 25-35 minutes, or until potatoes are tender. Carefully open the foil packets, as the steam will be hot, and enjoy straight form the pouch, or slide out onto a plate.